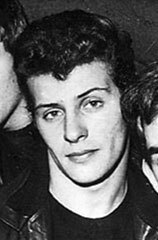 Pete Best was drummer with the Beatles from 1960 to 1962 and at one point he was the most popular member of the group among the majority of Liverpool fans. In fact, in 1962, Mersey Beat was to observe that he was: 'a figure with mystique, darkly good-looking and seemingly the one likely to emerge as the most popular Beatle.' He was born Peter Randolph Best in Madras, India on 24 November 1941. His English parents were stationed in India at the time, where his father, John, was an army physical training instructor and his mother, Mona, was a nurse in the Red Cross. Following the birth of Pete's brother, Rory in 1944, the family sailed to England, moving to Liverpool and initially settling into a flat in Casey Street. Two years later they moved to 8 Haymans Green, a 15-room Victorian house in the West Derby district of the city. When, at the age of 16, Pete began to take an interest in skiffle and rock 'n' roll music, he was encouraged by his parents. As so many friends were dropping in to see Pete and Rory, their mother suggested a novel idea -- they could have a meeting place of their own by utilising the seven adjoining basement rooms. The idea developed until they decided to turn the basement into a coffee bar-style venue, which was similar to Lowlands, a nearby club. Mona (generally known to everyone as 'Mo') and her sons, together with about ten friends, began work on converting the basement. They had decided to open during the week as a coffee bar -- where youngsters could dance to jukebox music -- but would hire live groups for the weekend. One of their helpers was Ruth Morrison, the girlfriend of George Harrison, who suggested that the Les Stewart Quartet, of which George was a member, could play at the club. They were currently appearing at the Lowlands club, which was situated on the opposite side of the street, 50 yards down from the Bests' home. As a result, George and Ken Brown, another member of the quartet, came around to see Mo. However, group leader Les Stewart didn't want to appear in the new coffee club, which Mo called the Casbah, and he had an argument with Brown. Brown left the group and George followed. 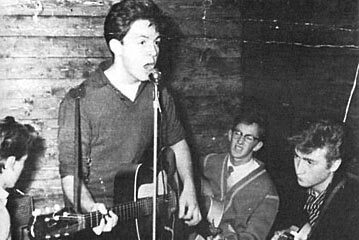 George then turned up with John Lennon and Paul McCartney and they teamed up with Brown as a quartet, assuming the former name of John's skiffle group, the Quarry Men, to begin their residency. The group didn't use a drummer at the time. The club officially opened on Saturday 29 August 1959 and within a year they enrolled 1,000 members. On Saturday 10 October 1959 there was a dispute because Brown was unable to play, yet Mrs Best still paid him a share of the group's fee. As a result, John, George and Paul walked out on their residency and sacked Brown. Ken then encouraged Pete to form a new outfit with him and to take over a residency at the club. They called themselves the Blackjacks (the original name of Lennon's first group). Brown played rhythm, Charles Newby played lead, Bill Barlow played bass and Pete became the group's drummer. Mo bought Pete a drum kit from Blackler's store (where George Harrison was to work for a time) and the group repertoire comprised numbers from rock 'n' roll acts such as Little Richard, Jerry Lee Lewis, Chuck Berry and Carl Perkins. In the meantime, the Quarry Men underwent a number of name changes ranging from Johnny & the Moondogs to the Beatals to the Silver Beetles, and enlisted the services of drummer Tommy Moore. As the Silver Beatles, they toured Scotland, backing Johnny Gentle and then began appearing in Liverpool, mainly at the Jacaranda Coffee club, the Grosvenor Ballroom, Liscard and the Institute, Neston. On 6 August 1960 their Grosvenor gig was cancelled when Wallasey Corporation withdrew promoter Les Dodd's licence to operate there and that evening they dropped into the Casbah club, where they saw Pete perform with the Blackjacks. His new blue mother-of-pearl drum kit particularly impressed them. At that time they had accepted their first Hamburg booking, which was to commence on 13 August. However, they were without a drummer as Tommy Moore had left them. One afternoon Paul phoned Pete at home and asked: "How'd you like to come to Hamburg with the Beatles?" Aware that the Blackjacks were on the point of disbanding and excited by the prospect of foreign climes Pete accepted and successfully auditioned for the band at the Wyvern club. After playing together for 20 minutes on numbers such as 'Shakin' All Over', they told him, "You're in!" The line-up of the Beatles now comprised John Lennon (rhythm/vocals), Paul McCartney (rhythm/vocals), George Harrison (lead/vocals), Stuart Sutcliffe (bass/vocals) and Pete Best (drums). Arriving in Hamburg they discovered they were not playing at the Kaiserkeller as they had assumed, but at a smaller club called the Indra, which was further down, at the seedier end of the Grosse Freiheit. After several weeks at the Indra, they then played at the Kaiserkeller and when their season was coming to an end, they had intended to move on to the Top Ten Club in the nearby Reeperbahn. The groups' sleeping quarters were cramped ones at the rear of the Bambi Kino, owned by Bruno Koschmider, who ran the Kaiserkeller. Stu Sutcliffe moved out to live in Astrid Kirchherr's house and, when Koschmider found the group intended to move on to the rival Top Ten, George was deported for being under age. John, Paul and Pete moved into the dormitory of the Top Ten, intending to play for a season at the club as a quartet with Stuart. As Pete and Paul needed to collect the rest of their belongings from the Bambi Kino, they crept along there one night to pack. In the windowless rooms, there was no light so some lateral thinking had them pinning condoms into a frayed tapestry in the hall and then lighting them. The condoms singed the tapestry and that evening the police came and arrested the two of them for allegedly trying to set fire to the premises. Pete and Paul left their equipment behind and John remained in Hamburg for a further week, while Stuart decided to stay on with Astrid. Mona Best phoned Peter Eckhorn, who sent their kit over by ship, and the group then intended to take up a residency at Williams' new club, the Top Ten. Unfortunately, it burned to the ground and the Beatles were left with few bookings. Mo got to work, offering them several gigs at the Casbah, setting up some promotions of her own to keep them in work, and Pete and Mo began to take over the bookings for the group. They were, in effect, managing the Beatles at the time. Through Bob Wooler, the group were booked by Brian Kelly for Litherland Town Hall on 27 December 1960 -- a highlight in their local career. Their baptism of fire in Hamburg had made them an exceptionally dynamic outfit.